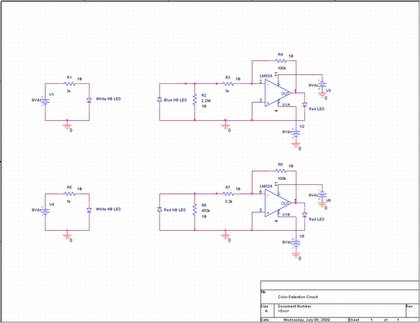 This circuit demonstrates the application of light detection in a color sensing system. Color sensing circuits are often used in robotic systems to help in navigation. The "line follower" is a popular example of this. In this circuit, a white LED is emitting light, while a reverse biased blue LED is aimed in the same direction waiting to detect light. When an blue object is passed in front of the white LED, the object reflects back the blue light. This reflected light is then picked up by the blue receiving LED and sent through an amplifier circuit. The amplifier circuit simply boosts the signal so that a small red LED can turn on to show that a blue object has been detected. The sensitivity of the circuit depends on the make of the LED. For some LEDs, the response curve for reverse-biasing covers a large range of wavelengths, thus the LED will not distinguish between colors with relatively close wavelengths.